This article provides an overview of the major classes of phytochemicals, particularly polyphenols, with examples of their common food sources. It highlights the international evidence for their anti-cancer mechanisms of action and other clinical benefits, as well as discusses the pros and cons of concentrating them into nutritional supplements to harness and boost their health benefits. There is a wide range of dietary phytochemicals, but one of the largest and well-known groups being the polyphenols. The average total dietary intake of polyphenols is reported to be over 1g per day, which is up to ten times higher than that of all other classes of phytochemicals. The polyphenols which can be subcategorized as the flavonoids, phenolic acids and other non-flavonoid polyphenols. A miscellaneous category with some properties within these 3 groups e.g. the betaines,chlorophylls and capsaicin. Dihydrochalcones; phloridzin,aspalathin (apples, rooibos tea). Hydrobenzoic acids; gallic acid, ellagic acid, vanillic acid (rhubarb, grape seed, raspberries, blackberries, pomegranate, vanilla, tea). Ginkgolides (Bilobalide Ginkgo Ginkgo biloba). Indoles, Indole-3-Carbinol (I3C) (broccoli, brussel sprouts). Carotenoids found in leafy green vegetables and carrots, have been in a number of larger population studies to be linked with a lower risk of breast cancer as well as ovarian and pancreatic cancers in smokers. [Hu, Tung, Banim, Chaoyang]. Sulfuraphane and Indol 3 carbinol in broccoli and other cruciferous vegetables, such as cabbage, cauliflower, Brussel sprouts and radishesrich in have been associated with a lowerprostate cancer risk [Joseph]. Broccoli induces the anti-oxidant enzymes glutathione S-transferases which explains why it is particularly beneficial in the 50% of the population carrying a mutated glutathione gene (GSTM1) [Heinen]. Curcuminoids found in in curcurmin, gives turmeric its yellow colour. Research has also shown that there are low rates of certain types of cancer in countries where people eat curcumin at levels of about 100 to 200 mg a day over long periods of time. A clinical trial looked at giving curcumin to patients with pre cancerous changes in the bowel show that it could stop the precancerous changes becoming cancer [CRUK]. A number of laboratory studies shows it can able to kill cancer cells and prevent more from growing. It has proven effects on breast, prostate, bowel, stomach cancer and skin cancer cells. A 2007 American study that combined curcumin with chemotherapy to treat bowel cancer cells in a laboratory showed that the combined treatment killed more cancer cells than the chemotherapy alone. Tannins and phenolic acids ingreen tea lower risk of breast, prostate, ovarian and oesophageal cancer particularly among smokers and alcoholics [Sun, Wu 2006]. High green teaintake after cancer reduced relapse rates both for breast [Ogunleye] and colorectal cancer [Zhu]. It also decreased the abnormal white cell count in 30% of patients with chronic leukaemia and reduced the levels of several proliferation factors, as well as PSA among men with prostate cancer [Shanafelt]. Ellagic acidis found in pomegranate, which in phase II and randomised studies involving men with prostate cancer, itslowed the rate PSA progression and other markers of cancer progression especially if given in a combination of other polyphenol rich foods as a supplement [Paller, Thomas, Carducci, Pantuck]. Lignans- Women with breast cancer who had the highest serum lignan levels, reflecting good intake of legumes, cereals, nuts and soya, were reported to have the lowest risk of death [Buck 2011]. Likewise, a lignan and polyphenol rich diet was associated with a lower colorectal cancer relapse rate [Zhu]. Isoflavonesand flavanonesfoundpulses and soy productsare linked with lower breast and prostate cancer especially if they had regular intake from childhood [Song-yi]. The largeShanghai Breast Cancer Survival Study showed that women with the highest intake of the phytoestrogenic polyphenols isoflavones and had a 29% lower risk of relapse and death [Boyapati]. Flavonoids such as quercetin found in onions, have been shown to reduce theincidence of numerous cancers particularly those arising from the lung in smokers [Knekt, Le Marchand]. Phenolic and caffeic acids in coffee has been shown to reduce the risk of all types of skin cancers [Song, Loftfield] and colon cancer growth in laboratory studies [Kang]. Zeaxanthin rich foods, found leafy green vegetables, reduced the subsequent new skin cancer formation after treatment of a primary lesion in a large Australian study [Heinen]. Potential anti-cancer mechanisms of phytochemicals? 1. Antioxidant properties The most quoted cancer prevention mechanism is via their antioxidant activity, elicited either through direct free radical absorption or through induction of antioxidant enzymes such as superoxide dismutase (SOD), catalase and glutathione via a variety of molecular mechanisms [Reuland, Johnson]. One of these mechanisms is via activation of Nrf2, which switches on genes that code for antioxidant as well as detoxification enzymes [Reuland, Johnson]. Phytochemicals have also been shown to inhibit the conver­sion of pro-carcinogens to their electrophilic (DNA damaging), particularly the thiol class such as sulforaphane [Gasper, Johnson]. A number clinical studies involving known common carcinogens have highlighted the antioxidant properties of phytochemicals. One experiment involved the known house-hold carcinogen triclocarban, commonly found in detergents and cleaning agents. Healthy cells exposed to triclocarban tend to mutate into pre-malignant cells, however, the amount and rate of carcinogenesis was significantly reduced by adding curcumin to the petri disk culture feeds [Sood]. In another study, volunteers who ate a diet rich in kaempferol were found, on serum and urine analysis, to haveimproved SOD activity and higher urinary concentration of these polyphenols [Kim]. Rats exposed to cigarette smoke given indole-3-carbinol, a phytochemical rich in cruciferous vegetables, had a lower lung cancer rate than those not given idole-3-carbinol [Morse 1990]. Subjects eating a meal of onions, which increased their serum levels of quercetin, demonstrated decreased levels of oxidative metabolites including 8-hydroxydeoxyguanosine (8-OHdG) a marker of DNA damage and repair [Boyle, Wu]. A clinical study from Singapore gave Chinese smokers 170g of watercress a day, rich in the indole-3-carbinol, and found a similar effect on urinary markers of DNA damage [Hecht]. Marinating meat in rosemary and thyme, has been reported to reduced the serum levels of carcinogenic heterocyclic amines (HCA) by 87% compared to subjects who eat the meat unseasoned [Smith]. 2. Reducing chronic inflammation. Another key anti-cancer mechanism of phytochemicals appears to be their ability to reduce inappropriate inflammation. It is now well established that inflammation is intimately involved in the cancer process, particularly in the promotion and progression stages of cancer. Inflammation is closely associated with oxidative stress and activation of NF-kappa B family of transcription fac­tors. These factors regulate more than 150 genes involved in mechanisms of cell survival and these target genes are not just pro-inflammatory but also oncogenic. Numerous phytochemicals have been shown to inhibit NF-kappa B signaling particularly the green tea polyphenol epigallocatechin-3-gallate (EGCG), curcumin and bilberries [Karlsen]. 3. Direct biological effects. More recently, it has been discovered that phytochemicals have an affect on several cancer process through modulation of cellular and signalling events involved in growth, invasion and metastasis [Johnson]. Pomegranate, for example, rich in the polyphenol ellagic acid, has been shown to directly inhibit cell growth and induce apoptosis in androgen sensitive and aggressive human prostate cancer cells [Retitig, Malik]. It has also been reported to inhibit processes involved in cancer metastasis in a study involving oestrogen sensitive and resistant breast cancer cell lines showing increased markers of cell adhesion and migration in cancer but not normal cells [Lansky]. In another studying it inhibited a chemokine that attracts breast cancer cells to the bone [Rocha]. Curcumin slows cancer cell growth by blocking the cell cycle, increasing the rate of apoptosis and preventing the invasion and migration of cells [Somasundaram, Zhang, Dorai, Iqbal]. It has also been found to halt the growth of stem cells that give rise to breast cancer without harming normal breast stem cells [Handler]. Curcumin is able to modulate miRNA expression in breast cancer cells leading to a reduced expression of Bcl-2 [Yang, 2010] and stabilisation of tumour suppressor gene in colorectal cancercell lines[Mudduluru]. Green tea, rich in epigallocatechingallate (EGCG), has demonstrated significant reduction of several factors that promote cancer cell growth, de-differentiation and angiogenesis [Shanafelt, Pietinen, Voorrips]. It has also been shown to block ornithine decarboxylase, an enzyme which signals cells to proliferate faster and bypass apoptosis [Yang, Liao). Broccoli sparks numerous genetic changes, activating cancer suppressor genes and switching off promotion genes [Moysich]. Resveratrol has demonstrated epigenetic regulatory properties which influence regulate cell survival and apoptosis in prostate cancer by global modulation of gene expression through deacetylation of FOXO transcription factor [Chen]. 4. Phytochemical (Hormonal effects) Some polyphenols and other phytochemicals are also able to influence cancer via a hormonal mechanism. Phytoestrogenic compounds, most notably isoflavones and lignans found in soy products, legumes and to a less extent some cruciferous vegetables, weakly bind to the oestrogen receptor without stimulating proliferation of the cells yet at the same time blocking the binding of more harmful oestrogens including those produced endogenously [Smith]. This explains why in the,Shanghai Breast Cancer Survival Study women with the highest intake of isoflavones and flavanones rich foods had a lower risk of death [Boyapati]. In men, phytoestrogenic compounds have been shown to affect 5 alpha reductase lowering endogenous testosterone levels. This may partly explain why men who eat phytoestrogenic foods such as beans and pulses have a lower risk of prostate cancer. Can concentrating foods into supplements enhance their benefits? The majority of studies, to date, have evaluated extracted chemicals such as vitamins and minerals. Some have shown a benefit. For example, a recent meta-analysis of studies reported that women who took supplements providing an average daily intake of vitamin C over 100mg had a reduced risk of breast cancer relapse [Harris]. The SU.VI.MAX study randomised French adults to a single daily capsule of ascorbic acid, vitamin E, beta carotene, selenium, and zinc, or a placebo and found no reduction in mortality or cancer specific mortality overall [Hercberg] although a further analysis in men found a reduction in the risk of prostate cancer. The authors postulated this difference between the sexes was related to French men having a lower baseline micro-nutrient status [Meyer 2005]. A major trial of selenium and vitamin supplements in a poor region of China demonstrated reduced risks of oesophageal cancer; at the time this population were known to have widespread micro-nutrient deficiencies [Blot]. Unfortunately, most other studies of vitamin and minerals or other extracted nutrients have shown no benefit or have actually shown an increased risk of cancer.For example, the CARET study found that beta carotene and retinol increased the risk of lung cancer [Omenn]. The Health Professionals Follow up study (HPFS) which followed the lifestyle habits of 51,529 male professionals for over 15 years found that men who took very high doses of zinc (>100mg/day), or took it for long durations were more than twice as likely to develop advanced prostate cancer compared with controls [Leitzmann]. The randomised SELECT study showed an increased prostate cancer incidence with vitamin E and selenium supplementation [Klein]. A further analysis of the HPFS found that of the 4,459 men who had developed prostate cancer those who took selenium supplementation of ≥ 140 μg/d after diagnosis were associated with a 2.60-fold greater risk of prostate cancer mortality [Kenfield]. The negative effects of vitamin E and beta carotene were once again demonstrated in the ATBC study which found them to increase lung cancer risk, although subsequent analysis showed men with pre-intervention low plasma levels of beta-carotene had a lower prostate cancer risk following supplementation and those with high levels had a higher risk, particularly in smokers[Heinonen]. This u-shaped distribution of risk was also observed in the EPIC study where those with folate-deficient diets and those with the highest intake both had a higher risk of cancer [Chuang]. These data have prompted organisation such as the National Cancer Institute to issue statements stating that long term vitamin and mineral supplements should ideally be given to correct a known deficiency [Greenwald] which is rarely routinely detected unless individuals have self funded micro-nutrient analysis (link). More recently academic attention has turned towards the evaluation of concentrated whole food supplements, particularly foods rich in polyphenols and other phytochemicals such as herbs, spices, green vegetables, teas and colourful fruits which have appeared to be beneficial in environmental cohort studies. Despite some initial encouragement from smaller evaluations [Giovanni], studies of extracted lycopene or genistein given on their own in more scientifically robust analysies have not demonstrate a benefit for either prostate cancer or benign prostatic hypertophy [Barber, Clark, Brasky, Spentzos], nor were there a links with the reduction in the risks of breast cancer with regular intake [Hu]. Of more concern, a randomized study from Memorial Sloan Kettering reported that serum taken from women who had take very high dose soy supplementation (25.8 g twice a day) added to laboratory tumour cells caused them to proliferate faster and overexpress the tumorigenic growth factors [Shike]. This supports the notion that phytoestrogen foods are healthy but concentrated them into strong supplements is not recommended. On the other hand, no study of non-phytoestrogenic foods supplements, have shown any detrimental effects on cancer outcomes and some have beneficially influences progression rates, as highlighted above [Brasky,Shröder,Shanafelt, Carducci]. Interesting one of the most popular supplements, Saw Palmetto, despite an effect in early small studies, showed no benefit for prostate cancer or benign prostatic hypertrophy in the largest randomised evaluation [Bent]. Likewise, another popular supplement lycopene despite similar suggestions from smaller non-randomised trials [Clark, Giovanucci] showed no benefits in a more robust evaluation. So far, the largest trial analysing phytochemical-rich food extracts wasthe National Cancer Research Network Pomi-T study. This study combined four different food types (pomegranate, green tea, broccoli and turmeric) in order to provide a wide spectrum of synergistically acting nutrients, whilst at the same time avoiding over-consumption of one particular phytochemical. 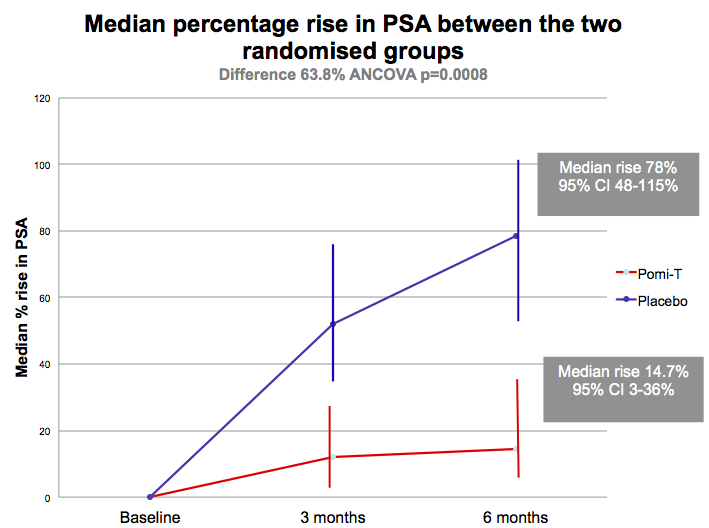 It involved two hundred men, with localised prostate cancer managed with active surveillance or watchful waiting experiencing a PSA relapse following initial radical interventions. 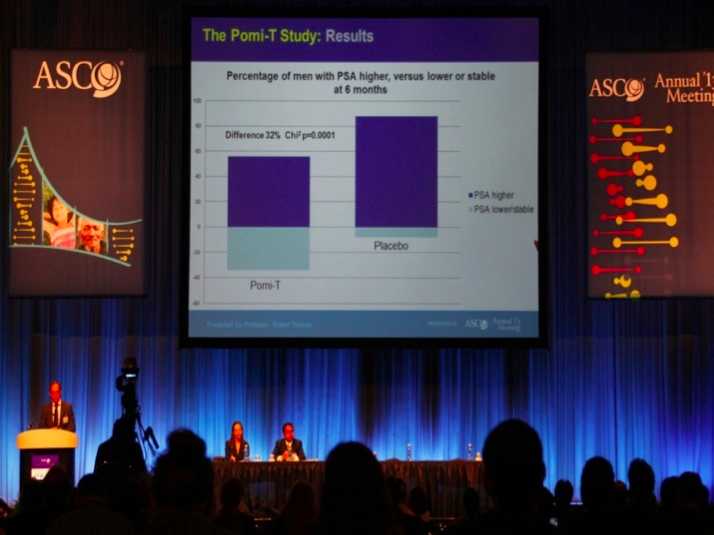 The results, announced as an oral presentation at the American Society of Clinical Oncology conference Chicago, showed a statistically significant, 63%,reduction in the median PSA progression rate compared to placebo in both men on active surveillance and experiencing a PSA relapse post treatment. A further analysis of MRI images, showed the cancers size and growth patterns correlated with PSA changes, excluding the possibility that this was just a PSA rather than tumour effect [Thomas 2016]. It was well tolerated, apart from some mild loosening of the bowels in 10% of men, and there was no effect on testosterone levels. At 6 months, significantly more men opted to remain on surveillance rather than proceeding to expensive radiotherapy, surgery or medical castration which can cause unpleasant effects such as depression, hot flushes, weight gain, osteoporosis, erectile dysfunction [Thomas]. A number of other RCT’s involving whole food phytochemical rich supplement have demonstrated benefits for some of the distressing symptoms common after cancer treatments such as fatigue [Barton] and urinary infections [Bonetta]. There are currently over 10 on-going studies registered with the National Institute of Health.In the UK, the Institute of Preventative Medicine have plans to include the Pomi-T supplement into the next national prostate cancer prevention study. This study will be recruiting men with a higher genetic risk of prostate cancer identified in the national RAPPER study co-ordinated from the Institute of Cancer Research. Further trials are being designed involving men with prostate cancer already on androgen deprivation therapy and individuals with skin, colorectal and bladder cancer. In the meantime, a trial is passing through the regulatory process to investigate whether the natural anti-inflammatory properties of these ingredients could help joint pains after breast cancer. There is increasingly convincing evidence to show that phytochemicals not only do they improve our daily lives by helping our food taste, smell and look appetizing they reduce our risk of cancer but help people living with and beyond treatments. 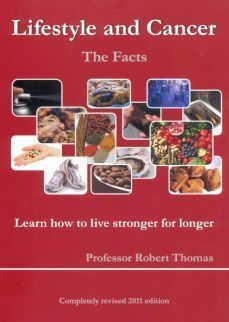 Living well programmes, slowly being introduced in the UK, are beginning to highlight the importance of phytochemical rich diets, along side other lifestyle factors largely being driving by the National Survivorship Initiative and guidelines from influential organisations such as American Society of Clinical Oncology [ASCO].Going a step further and concentrating these foods or extracted elements of these foods into nutritional supplements gives an opportunity to boost their beneficial anti-cancer effects but have their pitfalls. Studies of concentrated minerals, vitamins and phytoestrogenic supplements have reported detrimental effects although no study has reported detrimental effects of whole non-phytoestrogenic food supplements and some significant advantages. Despite these potential benefits and reports that over 60% of patients living with and beyond cancer take nutritional supplements, oncologist have been reluctant to discussing theirpros and cons due to a lack of RCT from academic institutions [Uzzo, Bauer]. Hopefully this trend will change particularly following the success of the Pomi-T study [Thomas]. Higher intake of phytochemical rich foods such as colourful fruit vegetables, herbs, pulses, spices and teas is associated with a lower risk of cancer and relapse after treatments. Their anti-oxidant properties help protect our DNA from ingested or environmental carcinogens. Phytochemicals, particularly polyphenols have direct anti-cancer mechanism of action via inflammation, modulation of cellular and signaling events involved in growth, invasion and metastasis. 1. World Cancer Research Fund/American Institute for Cancer Research. Food, Nutrition and the Prevention of Cancer: A Global Perspective. AIRC: Washington; 2007. 2. Key TJ. Fruit and vegetables and cancer risk. British Journal of Cancer 2011;104: 6Ð11. 3. Block G, Patterson B and Subar A. Fruit, vegetables and cancer prevention: a review of the epidemiological evidence. Nutrition and Cancer 1992;18(1): 1Ð29. 4. Scalbert A, Johnson I and Satlmarsh M. Polyphenols: antioxidants and beyond. American Journal of Clinical Nutrition 2005;81(1): 215S-217S. 5. Bauer CM et al. Prevalence and correlates of vitamin and supplement usage among men with prostate cancer. Integrative Cancer Ther 2012;11(2): 83-9. 6. Uzzo RG et al. Prevalence and patterns of self-initiated nutritional supplementation in men at high risk of prostate cancer. British J of Urology Int 2004;93(7): 955-60. 7. Hu F et al. Carotenoids and breast Cancer risk: a meta-analysis and meta-regression. Breast Cancer Research and Treatment 2012;131(1): 239-53. 8. Tung K et al. Association of dietary vitamin A, carotenoids and other antioxidants with the risk of ovarian cancer. Cancer Epi, Biomarkers & Preven 2005;14: 669. 9. Banim PJ et al. Dietary antioxidants and the aetiology of pancreatic cancer: a cohort study using data from food diaries and biomarkers. Gut 2012;62(10): 1489-96. 10. Chaoyang L et al. Serum alpha-carotene concentrations and the risk of death amongst US adults. Archives of Internal Medicine 2011;171(6): 507-515. 11. Joseph MA et al. Cruciferous vegetables, genetic polymorphisms and prostate cancer risk. Nutrition and Cancer 2004;50(2): 206-213. 12. Song-Yi , et al. Legume and isoflavone intake and prostate cancer risk: The Multi-ethnic Cohort Study. International Journal of Cancer. 2008;123(4): 927-932. 13. Giovannucci E, Rimm EB, Liu Y, et al. A prospective study of tomato products, lycopene and prostate cancer risk. J of the Nat Can Inst 2002;94: 391-98. 14. Knekt P et al. (1997) Dietary flavonoids and the risk of lung cancer and other malignant neoplasms. American Journal of Epidemiology 1997;146: 223Ð230. 15. Le Marchand L, Murphy SP, Hankin JH, et al. Intake of flavonoids and lung cancer. Journal of the National Cancer Institute 2000;92: 154 Ð160. 16. Rodr’guez-Ramiro D, et al. Cocoa-rich diet prevents azoxymethane-induced colonic preneoplastic lesions in rats by restraining oxidative stress and cell proliferation and inducing apoptosis. Molecular Nutrition & Food Research 2011;55: 1895-99. 17. Sun CL, Yuan JM, Koh WP, et al. Green tea and cancer risk: The Singapore Chinese Health Study. Carcinogenesis 2007;28(10): 2143-2148. 18. Wu LL et al. Urinary 8-OHdG: a marker of oxidative stress to DNA and a risk factor for cancer, atherosclerosis and diabetics. Clinica Chimica Acta 2004;339(1-20): 1-9. 19. Song F, Qureshi A and Han J. Increased caffeine intake is associated with reduced risk of basal cell carcinoma of the skin. Cancer Research 2012;72(13): 3282-89. 20. Loftfield E et al. Coffee drinking and cutaneous melanoma risk in the NIH-AARP diet and health study. Journal of the National Cancer Institute 2015;107(2): 1-9. 21. Pierce JP, et al. Influence of a diet very high in vegetables, fruit, and fiber and low in fat on prognosis following treatment for breast cancer: the Women's Healthy Eating and Living (WHEL) randomized trial. Journal of the American Medical Association 2007;298(3): 289-298. 22. Buck K, Vrieling A, Zaineddin AK, et al. Serum enterolactone and prognosis of post-menopausal breast cancer. Journal of Clinical Oncology 2011;29(28): 3730-38. 23. Zhu Y, Wu H, Wang PP, et al. Dietary patterns and colorectal cancer recurrence and survival: a cohort study. British Medical Journal Open 2013;3(2): e002270. 24. Boyapati SM. Soy food intake and breast cancer survival: a follow up of the Shanghai Breast Cancer Study. Breast Cancer Research and Treatment 2005;92: 117. 25. Ogunleye AA, Xue F and Michels KB. Green tea and breast cancer risk of recurrence: A meta-analysis. Breast Cancer Research and Treatment 2010;119(2): 477. 26. Shanafelt TD, et al. Phase I trial of daily oral polyphenon E (green tea extract) in patients with asymptomatic stage 0-II chronic lymphatic leukaemia. JCO 2009;27(23): 3808Ð3814. 27. Ornish D, Weidner G, Fair WR, et al. ; Intensive lifestyle changes may affect the progression of prostate cancer. Journal of Urology 2005;174: 1065-1070. 28. Pantuck AJ et al. Phase II study of pomegranate juice for men with rising PSA following surgery or radiation for prostate cancer. Journal of Urology 2005;173: 225Ð226. 29. Heinen MM, Hughes MC, Ibiebele TI, et al. Intake of antioxidant nutrients and the risk of skin cancer. European Journal of Cancer 2007;43(18): 2707-2716. 30. Swann R et al. The DietCompLf study: A prospective cohort study of breast cancer survival and phytoestrogen consumption. Maturitas 2013;75: 232-240. 31. Reuland DJ, et al. Upregulation of phase II enzymes through phytochemical activation of Nrf2 protects cardiomyocytes against oxidant stress. Free Radical Biol and Med 2013;56: 102Ð111. 32. Johnson I. Phytochemicals and cancer. Proceedings of the Nutrition Society 2007;66: 207-215. 33. Gasper AV et al. Glutathione S-transferase M1 polymorphism and metabolism of sulforaphane from broccoli. Am Journal of Clin Nut 2005;82: 128-91. 34. Sood et al. Induction of Human Breast Cell Carcinogenesis by Triclocarban and Intervention by Curcumin. Biochem and Biophys Res Coms 2013;438(4): 600-6. 35. Kim HY et al. Effects of phenol-depleted and phenol-rich diets on blood markers of oxidative stress, and urinary excretion of quercetin and kaempferol in healthy volunteers. Journal of the American College of Nutrition 2003;22(3): 217-223. 36. Morse MA, LaGreca SD, Amin SG, et al. Effects of indole-3-carbinol on lung tumorgenesis and DNA methylation in mice. Cancer Research 1990;50: 2613-2627. 37. Boyle SP et al. Absorption and DNA protective effects of flavonoid glycosides from an onion meal. European Journal of Nutrition 2000;39: 213Ð223. 38. Sandhir R. Quercetin improvesc mitochondrial dysfunctions induced by 3-nitropropionic acid: Implications in Huntington's disease. Biochimica et Biophysica Acta (BBA) - Molecular Basis of Disease 2013; 1832 (3): 421-430. .40. Smith JS and The Food Safety Consortium. Brush on the marinade, hold off the cancerous compounds. ScienceDaily 2007;June 28. 41. Carlsen MH, et al. The total antioxidant content of more than 3100 foods, beverages, spices, herbs and supplements used worldwide. Nutrition Journal 2010;9:3 1475-2891-9-3. 42. Malik A et al. Pomegranate fruit juice for chemoprevention and chemotherapy of prostate cancer. Proceedings of the National Academy of Sciences 2005;102: 14813Ð14818. 43. Lansky EP et al. Possible synergistic prostate cancer suppression by anatomically discrete pomegranate fractions. Investigational New Drugs 2005;23: 11Ð20. 44. Rocha A et al. Pomegranate juice s inhibit cell and molecular processes critical for metastasis of breast cancer. Breast Cancer Research and Treatment 2012;136(3): 647-58. 45. Somasundaram S, Edmund NA, Moore DT et al. Curcumin inhibits chemotherapy-induced apoptosis in models of cancer. Cancer Research 2002;62(13): 3868-3875. 48. Zhang HN, Yu CX, Chen WW, et al. Curcumin down regulates gene NKX3.1 in prostate cancer cell lines (LNcaP). Acta Pharmacologica Sinica 2007;28(3): 423-430.49. Dorai T. Therapeutic potential of curcumin in human prostate cancer. - inhibits tyrosine kinase activity of the epidermal growth factor receptor. Molecular Urol 2000;4(1): 1-6. 50. Iqbal M, et al. Dietary supplementation of curcumin enhances antioxidant phase II metabolosing enzymes in mice. Pharmacology & Toxicology 2003;92(1); 33-38. 51. Handler N et al. Synthesis of noval curcumin analogues and their evaluation as selective cyclooxygenase-1 inhibitors. Chemical & Pharmaceutical Bulletin 2007;55(1): 64-71. 52. Yang CS, Maliakal P and Meng X. Inhibition of carcinogenesis by tea. Annual Review of Pharmacology and Toxicology 2002;42: 25-54. 53. Mudduluru G et al. Curcumin regulates miR-21 expression and inhibits invasion and metastasis in colorectal cancer. Bioscience Reports 2011;31(3): 185-97. 54. Pietinen P, et al. Diet and risk of colorectal cancer in a cohort of Finnish men. Cancer Causes and Control 1999;10(5): 387-96. 55. Voorrips LE et al. Veg and fruit consumption and risks of colon in a prospective cohort study: The Netherlands Cohort Study on Diet and Cancer. Am J of Epi 2000 1;152(11): 1081-92. 56. Liao J, (2004). Inhibition of lung carcinogenesis and effects on angiogenesis and apoptosis in mice given green tea. Nutrition and Cancer 2004;48(1): 44-53. 57. Harris HR, Orsini N and Wolk A. Vitamin C and survival among women with breast cancer: a metanalysis. European Journal of Cancer 2014;50(7): 1223-1231. 58. Hercberg S , et al. 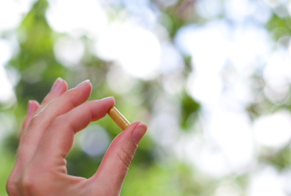 The SU.VI.MAX Study: a RCT of the health effects of antioxidant vitamins and minerals. Archives of Internal Medicine 2004;164(21): 2335-42. 59. Meyer F et al. Antioxidant vit & mineral supplementation & prostate cancer prevention in the SU.VI.MAX trial. Int J of Can 2005;116(2): 182-6.